29 September – I have been listening to Schostakovich’s 13th Symphony, otherwise known as Babi Yar, after the Yevgeny Yevtushenko poem that serves as the text for the first movement. Babi Yar is a ravine near Kiev, Ukraine, site of a mass grave for 150,000 men, women, and children, mostly Jews, who were executed in 1941 by the Nazis during the German occupation of Kiev. There are eyewitness accounts from surviving POWs claiming that the Nazis were particularly cruel: children and their mothers were stripped naked and executed in front of each other. 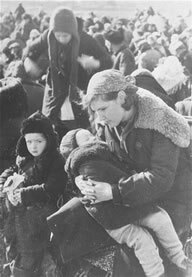 Mothers and their children assembled for mass execution at Babi Yar. Photo courtesy of The Berdichev Revival, Berdichev.org. Originally working withYevtushenko’s Babi Yar text, Shostakovich eventually extended the work into a five movement symphony at Yevtushenko’s suggestion based on additional material written by Yevtushenko, some specially for Shostakovich. Yevtushenko’s texts explicitly condemn Soviet and Russian anti-Semitism and complicity with ethnic persecutions in and beyond the Ukraine. Two recordings of Babi Yar come to mind: one, a beautifully produced definitive production from Teldec by the New York Philharmonic and New York Choral Artists underr Kurt Masur. Refined, precise, powerful, deftly rendered with a full, respectful understanding of both Shostakovich and Yevtuschenko. It is a live recording, and features Yevtuschenko himself reading both the title piece and a closing recitation, The Loss, a poem saying many of the things that were difficult to say inside the Soviet Union. The chorus and soloist are magnificent, delivering a clarity, unison, and power you’d expect from a top-flight orchestra and mass chorale. The other recording is from another world altogether. It is from a symphony and mass chorale consisting almost entirely of musicians from inside the old iron curtain under Ladislav Slovak recording under the Naxos label that pioneered CDs at cut-rate prices of lesser known, minor orchestras which might have a special or closer connection to the composer or their material. The Eastern European sound is radically different from the New York rendering: At times, it is hard to believe they are singing the same music. Never smooth, often jarring, raw and heavy, the Eastern European voices cut and crawl across the score as if struggling up from the graves of Babi Yar itself. In the softer passages they become ghosts, haunting and unnerving. It is an earthy, dark, deeply felt recording. These voices have an immediacy to them that tells us that it is not over yet, that this reality is not behind us. Yevtushenko tells us that the Soviets never placed a monument at Babi Yar. At that time only a small stone placed by the Ukranians says that some day there will be a monument placed at Babi Yar. Monument erected in 1966 at Babi Yar. 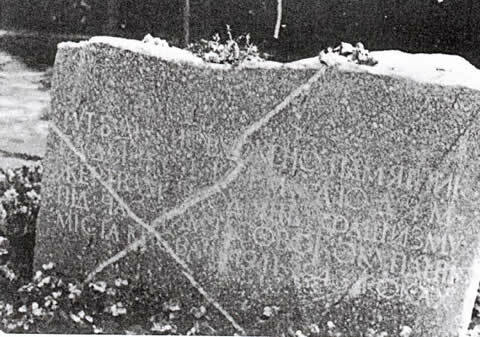 The Ukrainian text reads: “On this site there will be a monument for the victims of fascism (during the German occupation of Kiev, 1941 – 1943).” photo credit The Berdichev Revival, Berdichev.org. In 1982, a memorial park for Babi Yar was built in Denver, Colorado, with an inscribed black granite entrance gateway and a black bridge over a ravine. A special ceremony of Remembrance is held there every year on 29 September. Let us remember and work to create a world in which a Babi Yar becomes no longer possible. * Harlow Robinson interview of Yevtushenko for Stagebill, magazine of the New York Philharmonic, January, 1993, from Teldec liner notes, 1994. In 1941, on September 29, my brother was born in the US. I never knew, and I suppose my parents never told me of the date of Babi Yar. How terribly sad this story is. I am thanking Shostakovich and Yevtuschenko for making this memorial the monument it continues to be. Thank you for sharing this. Thank you, Susan. Let us work toward a world where such things are no longer possible.